Whether it is a country, business or profession domain that you are looking for, we have it. 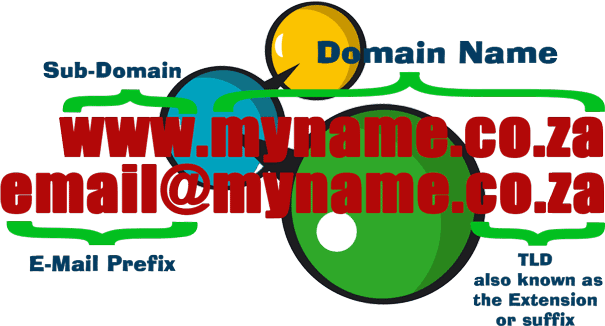 Search from our extensive list below to get your domain type and name registered. Register your domain name and Park it for free, Point it or Host it with us. How do I register for a domain name? Decide on a domain name or use your company name. Keep the name as short as possible and avoid any hyphens(-) if possible. Remember the other person has to remember your name, the easier the better. Lastly, click on the "Find my Domain Name" button below to get searching, or use the search box below to do a quick search. What does it cost when a domain name has expired? Redemption fees are charged when your domain name has expired, but before it is deleted from the internet, allowing you to reclaim the name. Remeber that if the name gets deleted it will be publicly available for anyone to register, on a first come first served bases and you may not be the one to register it again. DNS Management portal - FREE! Although we do not charge for the functionality of changing of DNS records there is a R50 charge if you require SA Domain to make these changes on your behalf. URL Forwarding portal - FREE! There is a R20 charge if you require SA Domain to create/modify the URL Forwarding on your behalf. What are the characters and valid character lengths for domain names? 2 and 3 character domains are classified as premium domains. Prices will be shown on search result. have a minimum of 4 and a maximum of 63 characters. begin with a letter or a number and end with a letter or a number. numbers (i.e. 0-9) and dashes (-) or a combination of these. neither begin with, nor end with a dash. not contain a double dash (e.g. www.ab--cd.co.za).